Tonight's guest review is Dan Levine. He's back with another great Star Wars review - tell us all about it, Dan! Hello, it’s Dan here. I did some reviews on the Sideshow 12” Anakin and Vader a long time ago, and I’m back here with another Star Wars review. With the start of a new year, Hasbro is starting a new line, titled The 30th Anniversary Collection, so named for the big “3-O” anniversary of the greatest movie saga ever. Although the basic figure line has been delayed here in the states (and are becoming common overseas and in Canada, even) Hasbro has started producing Battle Packs, the line of popular multi-packs, under the banner. So far, they have released a wave of two exclusive Target sets and two ‘everywhere’ sets. 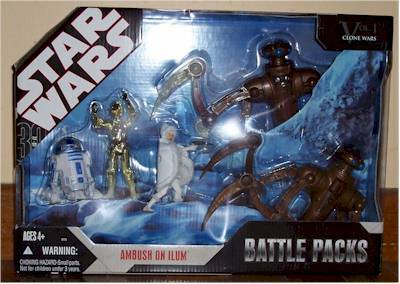 The set being reviewed today is the most interesting of the four, a Target exclusive titled “Ambush on Ilum”. It is the only set to feature figures previously unreleased in any form. For those who don’t recognize the set from the movies, it is based off of a sequence from the Clone Wars cartoons. Included in the set are: C-3PO (repaint), R2-D2 (re-release), “Snow Bunny” Padme (new figure) and two Chameleon Droids (new figures). The new 30th Anniversary black and gray scheme is more interesting than the previous “shot-up brown” scheme was. The back has a nice doctored Photoshop picture of the five figures in action, but it shows snow on the figures, which is rather off-putting. To me, you should show the figures and all that are included in the package, no more-no less...not that I actually expected it to come with snow. Another problem I have is how the figures are all squeezed into this tight box in these stupid poses surrounded by a cardboard diorama that looks nice, but unless you have a plan, it is going to end up ripped and torn apart. The plastic elastics bend the figures. 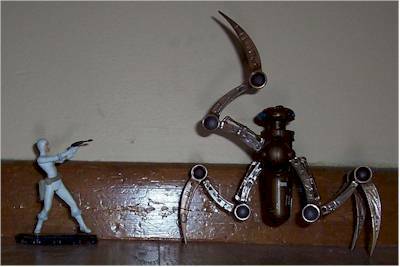 My R2’s center leg is twisted and Padme’s pistol barely made it out without being stuck pointing up. Due to varying origins, the qualities of each figure’s sculpt also varies. The R2 figure originates from 2001 and back in the day, it was a nice sculpt, but since then, Hasbro has bettered the astromech droid, with pop-out wires on the “feet” and a better light-up eye. None of this is on the figure. Hasbro has issued the new better sculpt plenty of times since its introduction as R4-G9 in 2005, so I can’t see why it keeps holding back from making the most famous droid in that sculpt. 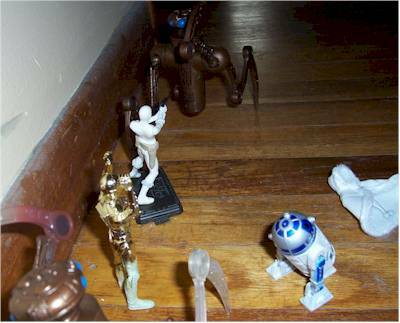 C-3PO is presented in his best sculpt yet: the 2005 Revenge of the Sith version. The problem with the sculpt is the hands. Threepio still seems to be missing thumbs and there is the annoying gap between the “thumb” and the fingers. Padme is one hundred percent new and was rumored to have been a single figure exclusive last year. The figure itself is rather disappointing, sculpt-wise. The face sculpt is rather generic and bears no resemblance to Natalie Portman and the legs are awkwardly posed (which is why in the pictures you see her standing with a base that IS NOT included in the set). The outfit is well done, with great lines and folds. The two Chameleon Droids are made from the same incredible sculpt. 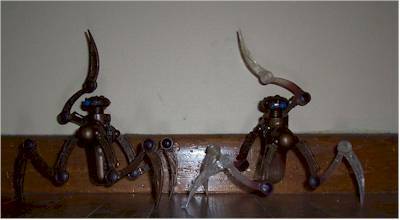 All eight legs (four for each) are sturdy and the bodies are expertly detailed. The R2 figure’s paint is downright pathetic. The blue in all areas is faded. The wires on the feet are represented by an incredibly thin line. Overall, it’s very disappointing, considering all the R2s that had come previously. 3PO is done pretty good and as good as the original. My only qualm is the legs: they were pained to represent snow, but I can’t understand why the right foot is painted yellow! Did 3PO step in “yellow snow”? Padme is disappointing here as well. The face is horrible with huge lips and bad eyes. Now, had this set supposed to be a cartoon version of the character, I suppose it would make sense. It is a very cartoonish face. However, this is supposed to be a realistic “movie/comic book” presentation, and it just doesn’t work. Again, the Chameleon Droids win in this category. The translucent droid is incredible. The colors do not shift from just brown to suddenly clear, but “melt” from brown to purple to clear. The solid droid is pretty straightforward: it’s all brown, save for the blue eyes. There is no bleeding at the eyes, which is always a good thing. R2 wins this merely by default. He has all the standard astromech points of articulation: “ankles”, “shoulders”, “head” and middle leg. C-3PO, being based off of the Revenge mold, has the great ball-jointed waist that everyone went nuts for in 2005 (including me). Thus, 3PO has shoulders, hips, neck and the ball-joint waist. In 2006, Hasbro issued a rehash the 2005 3PO from Return of the Jedi, complete with new knees with articulation. Those are missing here. It would have been nice, but seeing as a snowed-on 3PO doesn’t need to sit, it’s not a major deal. Padme yet again falls here. Hasbro has not put out pre-posed figures in ages, but here is one. All points are practically useless with the annoying pose. She only has neck, shoulders, rotating forearm, hips and waist articulation. This is silly, considering how much articulation has come over the past few years, that in 2007, a major toy company is still issuing figures with this limited articulation. The Chameleon droids have articulation at the neck, four ball-jointed “shoulders” and a movable joint at the first “elbow”. My main issue (which is why I took off a star) is that if Hasbro could afford to give a moving joint at the first “elbow”, why couldn’t they afford to give a joint at the second “elbow”? 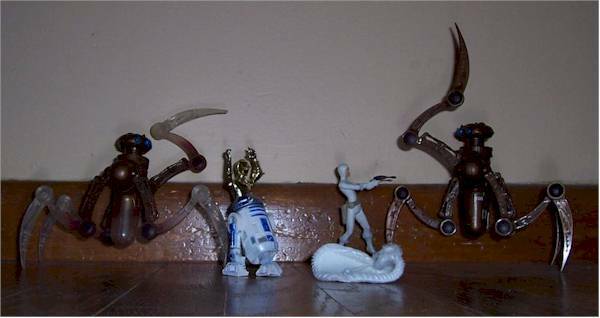 As you can guess, R2, 3PO, and the two Chameleon Droids do not come with accessories and I am not exactly sure what else they could have (although a bonus Count Dooku hologram would have been sweet). Padme comes with her signature pistol, which is a new sculpt and fits in her holster, which is always a bonus. 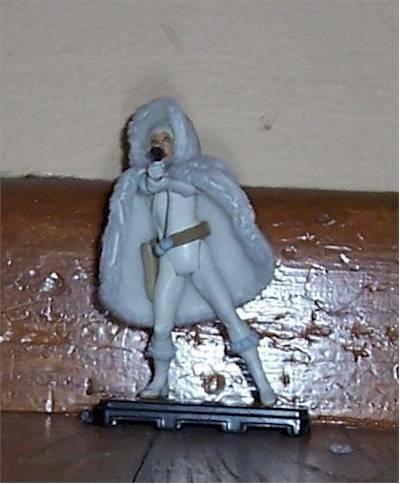 She also includes probably the best aspect of the set: her cloth poncho. It is amazingly done and fits perfectly around her neck. Honestly, Star Wars figures are fun, even when they aren’t as articulated as you would want them to. Being in my teens now, I still remember how much fun I had with those stupid “He-Man-esque” figures of the mid-nineties and I’m sure even now kids have fun with the new ones. Oh, come on! Five figures, two of them incredibly huge out of the package, for $20! That’s a steal in my book and considering it is an exclusive, it’s a double steal. Since the average figure now goes for at least $7, it could have been anywhere near $35, but that’s the cool thing about these Battle Packs: they are consistently cheap. One thing: The less warped the figure is already in the package, the less likely it able to come out of the package any more warped than it already is. Look before you buy, because if you don’t, your R2 will end like mine and won’t be able to stand. I really wanted to give this set a bad score, but I couldn’t see why. Yes, the R2 figure is horrible and the Padme figure is a HUGE let-down, but the Chameleon Droids are simply awesome and 3PO is just nifty to have. As I said before, this set is a mere $20, whereas some of the even less interesting multi-packs (like the Previews exclusive set of bland old men and yet another Vader) go for nearly double that. 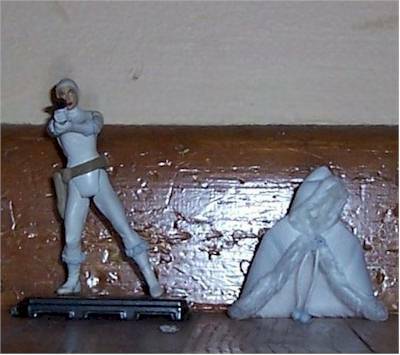 This set is a necessity for die-hard fans who have wanted a 3 ¾” “Snow Bunny” Padme for the longest time (I really can’t wait for the Sideshow 12” version), but if you just go for the movies, it is definitely safe to skip. This set is exclusive only to Target, so it shouldn’t be entirely hard to get it. I did a review on the site for the 2006 Carkoon Wave back last January. I have also reviewed Gentle Giant’s Vader statue, Sideshow’s Anakin Skywalker 12” Figure and the 2006 SDCC exclusive Dark Lord Anakin/Vader. I am looking forward to my next review, which will be Sideshow’s Leia in Boushh disguise, which is due out in the second quarter of the year. Figure from the collection of Dan Levine.